Blah Blah Blog: P.A.D 12/11&12/07 and Thank you! First off thank you so much to all of you who went over and left CJ some love! I really appreciate it! And back to our regularly scheduled December Program! Yesterday's photo is from a set of 6! Wendy made them for the family in memory of our Disney Trip this year! Aren't they the cutest! I just love them! Thank you Wendy! And today's photo! Following in my "star" posting this is the last tin star I have at the moment! I'm still waiting for the ones I ordered to alter to get here! GRRRRR! 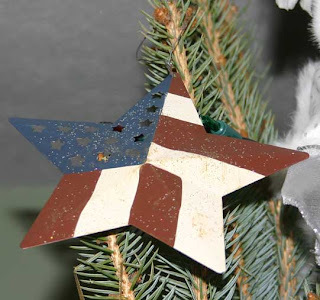 I love this Patriotic star and it's right up at the top of my tree near the angel! oh, those Mickey ones are cute, I bet Hannah would love to make some of those. I love your tin star ornaments, I hope your shipment comes soon! Love the Disney one - we are a DISNEY LOVIN FAMILY! 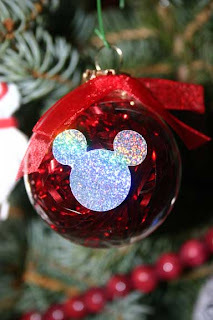 I have that same star ornament and I love it! Your Disney ornament is really cute. Very cute ornaments. Love that star flag! And Wendy's ornaments look adorable. I am loving you PAD project. Great job! I am going to do it for the whole year on my old blog for 2008..oh boy! Very nice. Cute idea with the Disney one! Simple and clever. Wow! I'm so honored my ornament made the PAD! Thanks for the compliments on them ladies. They were so fun and easy to make. I'm glad you all are enjoying them!